Having high self-esteem is important for people of all ages. It not only impacts how someone feels about themselves, but also their health, happiness, confidence, and motivation. When seniors have high levels of self-esteem, it helps them maintain independence, bounce back from any obstacles, and encourage them to feel happier and more fulfilled with their life. Keeping high self-esteem may not always be easy for aging individuals, but there are some things you can do to help encourage feelings of self-worth. Ask for Advice: Seniors are valuable sources of information. Having gone through different times and experiences, their viewpoints and opinions can vary in comparison to yours. When you turn to them for answers or input on important matters, it lets them know you value what they have to say and are eager for them to share their wisdom with you. Provide Compliments: Admire things that your loved one does well. If your grandmother makes a particularly amazing dessert, ask for the recipe. If your aunt always had a knack for putting together a great outfit, ask her to come shopping with you. Ask your father to paint you one of his beautiful landscapes to hang in your living room. Knowing you consider them an expert on the subject and want to imitate or display their talents can be quite flattering. 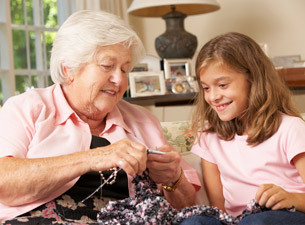 Encourage a Hobby: Promoting a hobby they already love doing such as knitting, cooking, playing games, or reading is great. You can also suggest a new activity like yoga or painting. Feeling a sense of accomplishment when a new pose is mastered, or they’ve finished making a cozy scarf for a grandchild is important to help get a sense of joy, purpose, and satisfaction out of life. Offer to Listen: Sometimes, all it takes is someone to lend an ear to help individuals feel better. Listening to your loved one talk about things they learned, did, or read about allows them to contribute to conversations with someone they’re comfortable with. Allowing them to reminisce about the olden days when they were younger or earlier times with the family is sure to bring feelings of delight. If your loved one is feeling sad, letting them talk to you about it and offering your shoulder and a comforting hug may be all that is required to help them get back on the path to happiness. 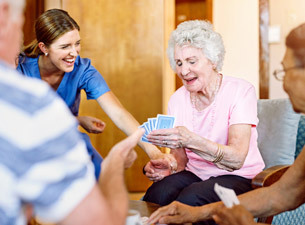 Connect Them to Others: Arrange for your loved one to be a part of a senior group or activity. This will promote socialization and help them to develop friendships, as well as possibly meet like-minded individuals. Socialization helps boost self-esteem naturally, as the interaction and communication makes individuals feel more involved, accepted, and gives a sense of being a part of something. At The Holiday Retirement communities, we offer a variety of activities, projects, and excursions to keep our residents engaged, socializing, and active. Gaining new friends and creating masterpieces to share with the family are just some of the benefits individuals experience during their time in our care. We open our hearts to everyone who comes through our doors and treat all our residents as if they were members of our own family.